For the last four years, volunteers from PGE have brought their knowledge of science, technology, engineering and math to the classrooms of Bridger Elementary. 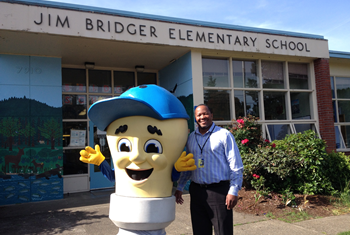 Located on the east side of Portland, Bridger has a Spanish immersion program and a high percentage of low income students, and PGE is opening up a whole world of opportunity for their future. The lesson that company employees teach about kinetic and potential energy is done entirely in Spanish and gives kids hands-on experience designing and building a balloon-powered car creating lots of excitement in the classroom. "Students look forward to these hands-on activities, which ignite their interest and solidify what we teach in the regular curricula," says Shannon Russell, fifth-grade teacher at Bridger. "Some of my students will be the first in their family to attend college. Having PGE volunteers come into the classroom gives students a real-world outlook and helps them set their goals high."